The last thing in the world Thom Creed wants is to add to his father's pain, so he keeps secrets. Like that he has special powers. And that he's been asked to join the League - the very organization of superheroes that spurned his dad. But the most painful secret of all is one Thom can barely face himself: he's gay. To survive, Thom will face challenges he never imagined. To find happiness, he'll have to come to terms with his father's past and discover the kind of hero he really wants to be. 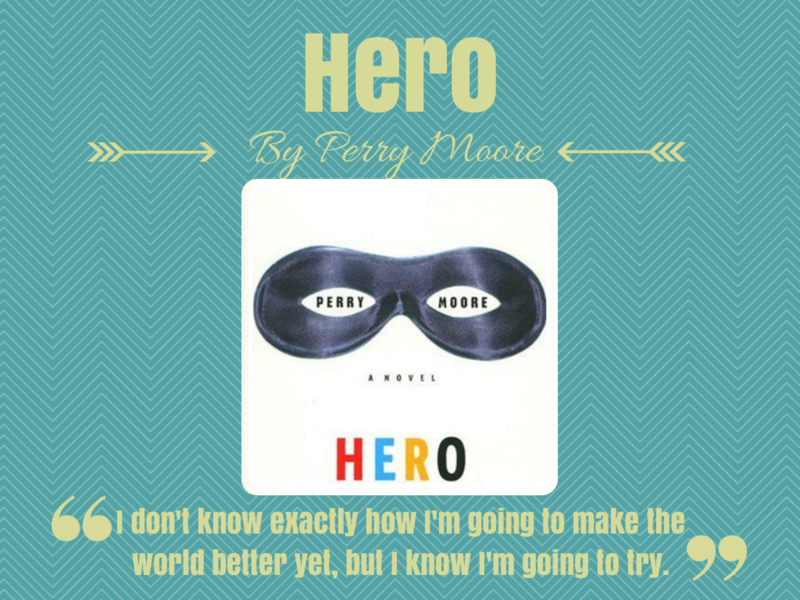 Last week I read Hero by Perry Moore and I LOVED IT. I read it over three days. There’s humour, drama and interesting characters. Thom Creed is an inspirational protagonist. The thing I love about Thom is that, although he is already a good person, he develops into a real hero over the course of the novel. He becomes that person who goes above and beyond what anyone else would be willing or able to do. It’s part of his power and it’s woven into the fabric of who he is. Thom lives in a world full of superheroes in flashy costumes and super-villains with cheesy names. It’s a comic book world. And yet, despite having a costume and powers of his own which makes him stick out from the world we know, he is incredibly human. Thom makes a lot of mistakes throughout the novel which is forgiveable considering the amount of pressure he has on his shoulders. His father, Hal Creed, used to be a prominent member of the League of superheroes that protect the city but Hal becomes an outcast after being unable to save innocent bystanders during a catastrophic event. Since then Hal has been constantly reminded of his fall from grace by his injuries and the bitter looks and comments that get thrown at him every day. The last thing Thom wants to do is add to his father’s problems, to the extent that he becomes afraid of revealing his power and sexuality to his father. So he ends up lying in order to maintain the status quo between him and his father. But his lies always come undone, with added consequences. There’s no doubt Thom is often stuck between a rock and a hard place. He wants to use his powers to save people by joining the League, but he can’t bring himself to tell his father for fear of his reaction. There are a few instances where Thom thinks about running away from all of his problems but in the end he sticks it out and becomes a stronger person for it. Thom’s unsteady relationship with his father is a key plot line that develops into something quite beautiful. Father and son struggle to understand each other and they often hurt each other along the way in frustrating ways, but there is real love behind their relationship which has you wishing and wishing that they can have a happy moment fuelled by acceptance and understanding. Thom has a lot of weighty personal problems. The world he lives in is frequently against him, whether it be because of his father’s reputation or his sexuality. It feels so frustratingly unfair. Yet the lesson Thom has to learn is to deal with his problems openly and from there he has to become less self-involved and learn about the pain others are experiencing. He has to be the healer who takes on the burdens of others and help them as best he can. How many people do you know who are truly that selflessly good? Who could look beyond problems and worries as heavy and legitimate as Thom’s and see the bigger picture? Who could find other people’s pain and treat it as important as their own? It’s the stuff that makes a human into something more, a hero. On top these serious developments there are lighter tones at play. I laughed and smiled at multiple points while reading this novel. Thom’s tussles with his misfit superhero crew are particularly entertaining. Another aspect of the plot I enjoyed was the slow development of Thom’s relationship with his love interest. As readers we can join the dots about the identity of the Dark Hero who is constantly trailing Thom a lot quicker than Thom does, but Thom’s slow realisation is true to his character as someone who needs to learn to see the bigger picture. Thom is a very entertaining and engaging first person narrator. I loved this book. I never wanted to step out of Thom’s world. I wanted to keep reading about him and his friends forever. I’m very sad that Perry Moore can never give us a sequel to his début novel. I’m glad he gave us this much and more through his other work.